You all know I love beads. Not only do I love beads, I love all things beady. 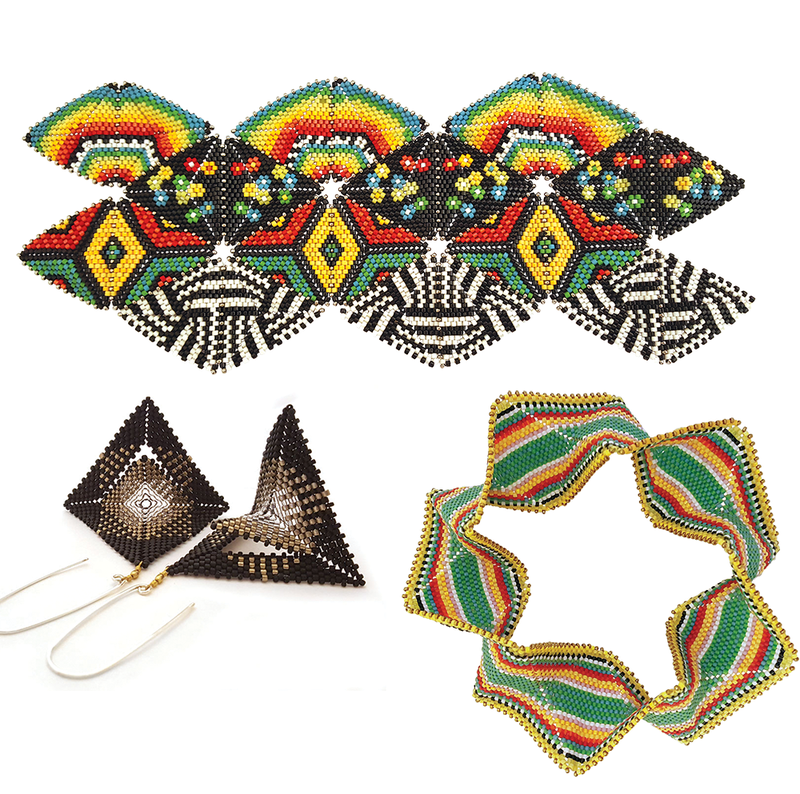 There are many bead artists who are exploring beadwork that is made from geometric shapes. It’s all one stitch, peyote. It can be triangles or squares. It’s colorful, it’s wearable and it can MOVE! This is too cool. It’s math. It’s geometry. Ok, now I’ve probably scared you but this is cool and we can do this. 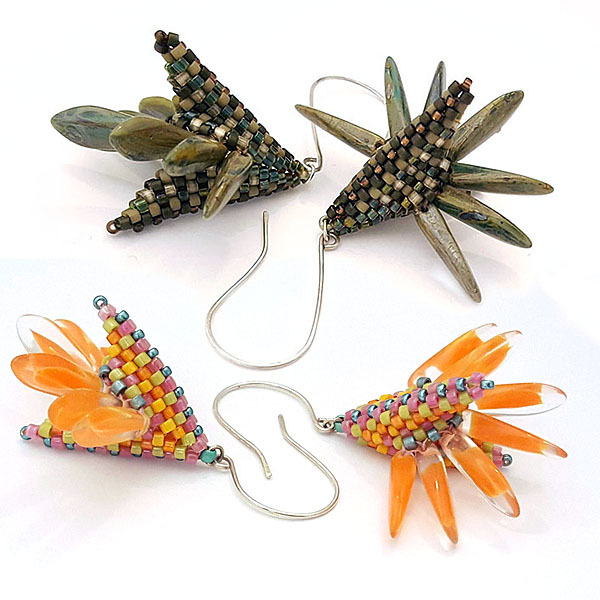 I’ve invited Kim Van Antwerp to join us for 3 days of beady fun. She will be here the end of October so check your calendar and give us a call to sign up. It’s going to be a blast. With her help we will learn the basics of Contemporary Beadwork. Where we take it from there is entirely up to you. 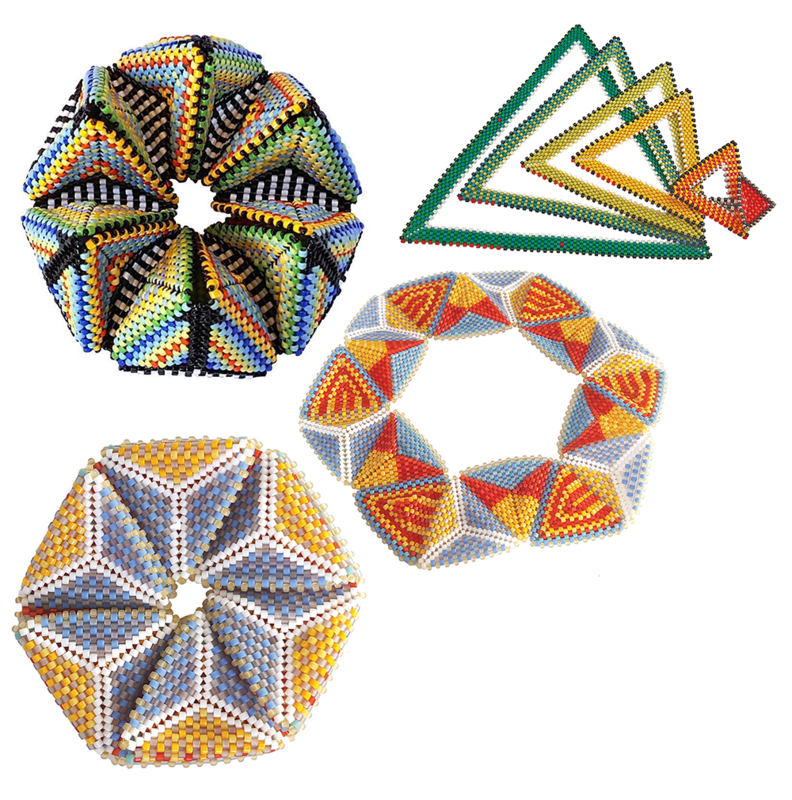 In this class we’ll explore geometric forms that can be built from simple peyote-stitch triangles, focusing on the popular kaleidocycle and flat-folding hexaflexagons. Either can be made as a wearable piece of mathematical art. When I say the beadwork can move, this is what I mean. Again, too cool! • Postcard with basic triangle threadpath. • Printed graph paper of triangles arranged into ‘hex faces’ so you can design your own. • Directions for making hinges and how to arrange triangles into mirror tetrahedra. • A fully laid-out folding net diagram for triangle placement. • Diagrams for folding puzzle bracelets, aka Hexaflexagons. • An all-new set of triangle/hex face designs. 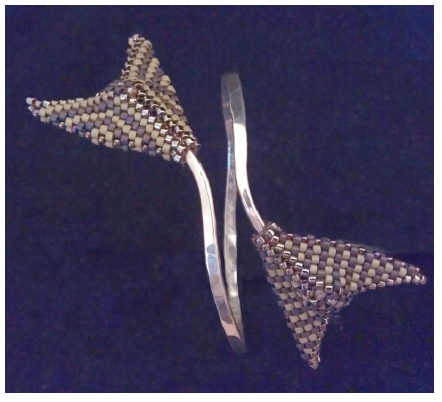 We’ll also talk in class about decreasing triangles into dimensional puffs and making large triangles to ‘explode’ into sets which can be used as casting models for easy-starting bangle bracelets. Class Fee $170 plus beads purchased in class. The dynamic peyote stitch square has a deceptively simple threadpath. There’s no trick to it, the tension of the thread makes it leap into the air of its own accord. It happily folds along the diagonals, too, opening the door to exciting, dimensional design! • Postcard with basic warped square threadpath. • Patterns for five pairs of coordinated squares, new for 2017. • Two pairs of brass swivels and earwires. • Printed graph paper of squares so you can design your own. • Handout showing ways to join squares into bracelets and wearable machines. • Origami directions for folding paper warped squares. We’ll get started with the basic square and then move forward into puffs, machines, joined bangles, and explosions, both partial and full. We’ll look at casting models and how they can be used to easily start CGB-style peyote-stitch bangle bracelets. And we’ll talk about color and pattern in designing warped squares. This versatile component is made of peyote stitch with increases, similar to the Warped Square, but is worked around a starting strip of modified Right Angle weave. The increases create a crease for folding the beadwork into this handsome arrowhead shape. Class Kit includes full-color, stepped-out instructions which include how-to for both applications, beads in assorted colorways to choose from, and student’s choice of sterling silver earwires or hammered bronze cuff finding. The technique of beading around the MRAW band is fun and fascinating, and I’ll bring samples of variations on this pattern. Check your calendars and consider joining us. It’s certain to be a fun and colorful time!